Our Mission: Make the Best Camisole Ever. If you are anything like us, you’ve noticed that most basics fit poorly, are cheaply made, and wear out quickly. At Foundation, we wanted to do things differently. We wanted to make the pieces you wear every day – your basics – better. To make the best camisole we started with the best fabrics – you can’t make a great cami from bad materials. Our luxe bamboo-based knit is many times softer than cotton, and our light stretch gently hugs you where you curve, providing support without constriction. Our luxe bamboo viscose fabric is many times softer than cotton, with light stretch so it don't constrict or bind. Our cami fit is contoured at the waist and hips to provide the perfect fit across a broad range of body types. Too much of what we buy falls apart, but Foundation camis are built to last. If you find a workmanship issue, just send a picture and we'll replace it. How should Foundation tops fit? Foundation basics are designed to be versatile. They can be worn as either undershirts/undergarments or as daily tops. 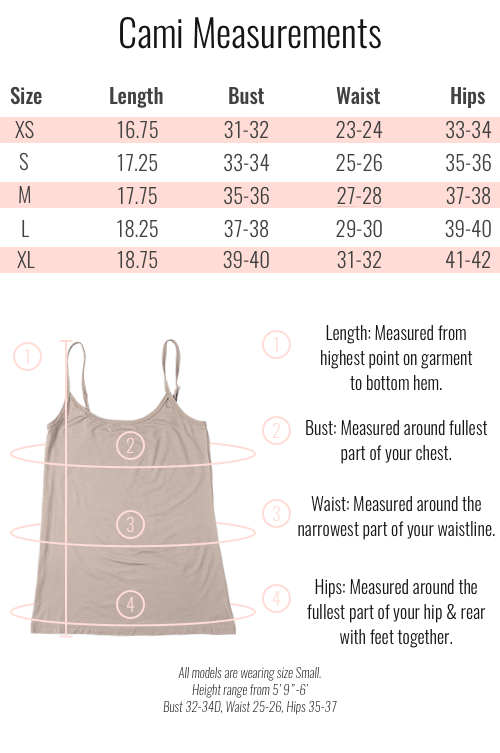 Pick the size that works best for how you will mostly wear them. Our models are all wearing size Small and as you can see vary in body measurements. Model height range 5’9” – 6’, Bust range 32C-34D, Waist range 25″-26″, Hip range 35″-37″. The 4% spandex and bamboo viscose naturally stretches and contours to your body without feeling constrictive. Why do you use Bamboo Viscose for the tops? Because it’s great fabric. Technically, it’s one of the softest fabrics in the world. Bamboo viscose has a lot of the characteristics of advanced technical fabrics in that it wears cooler than cotton and wicks moisture off your body to make you feel comfortable. For sustainability, we believe bamboo is a better product than cotton. Unlike cotton, which requires massive amounts of water to grow, bamboo requires almost no irrigation. And while there is some physical and chemical processing required to weave bamboo into cloth, it grows so fast that it’s sustainable. We think it’s a responsible environmental choice. How should I wash my Foundation tops? Our official advice is to wash on cold and dry cool or hang dry. In reality we wash and dry on warm and the tops don’t suffer much for it. They will wear a bit more and shrink a bit when you treat them poorly, so keep that in mind. Foundation allows free returns and exchanges for unused, unworn, unblemished and unwashed merchandise within 100 days of purchase (US customers only). To initiate a return for refund or exchange, please send an email to support@foundationwomen.com. Where are Foundation products manufactured? Our product is made in China. Since 2012, we’ve had an incredible relationship with a factory that specializes in bamboo viscose production. We strive to find partners who take care of their employees and follow strict environmental requirements. How does the VIP Subscription Program work? Foundation is all about optimizing our cost structure to deliver value to you and minimize consumer and environmental waste. One of the best ways we can do that is by being able to predict future orders. When you become a Foundation VIP Subscriber, you’ll be set up to automatically receive your products on a fixed interval. This allows us to better estimate how much product we need to make ahead of time, which means we can save money. We pass that savings on to you in the form of a big discount. As long as you maintain active VIP membership (and you can skip shipments as often as you’d like), you’ll be locked into your original pricing, even if prices go up in the future. We’ve made the program really easy to tune to your personal needs. A week or so before we ship any membership items to you, we’ll send you an email to let you know they’re on their way. If you’re not ready, just click the SNOOZE button in the email and we’ll delay your shipment by two months. You can snooze as often as you like. You can also pause or cancel your VIP Memberships at any time by going to foundationwomen.com/account. We ship to more or less the whole world. Our full country list is on our cart page. Just select your country list from drop down and hopefully we’ll be shipping you something soon! Do you make men's products? Absolutely! That’s actually how we got our start. The same amazingly comfortable bamboo viscose products can be found at www.mrdavis.com or on Amazon.